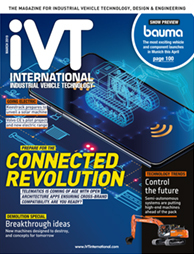 iVT Expo will bring to life the pages of the market-leading Industrial Vehicle Technology International magazine. Visitors will discover new materials; new engine technologies, including electric motors and hybrid applications; new control systems that question the need for hydraulics; sensors; testing and validation services and technologies, from durability rigs to EMC and NDT technologies; cabin equipment; the technologies required for operatorless/driverless vehicles; and innovative ideas that will help manufacturers of industrial vehicles ultimately improve product design, efficiency and thus sales. The expo will also feature companies displaying the latest and next-generation manufacturing and assembly technologies for industrial vehicles.